Thermosmart Windows supply and install a wide range of U.P.V.C window and door systems. Every window and door is custom made so there are no standard sizes, just unlimited design possibilities. Personalise your windows with some glass art, possibly some colonial bars inserted into your double glazed units, giving character to your home without any additional cleaning problems. Stained/Leadlight glazing can be encased into a sealed glazing unit to keep the traditional look of your home. 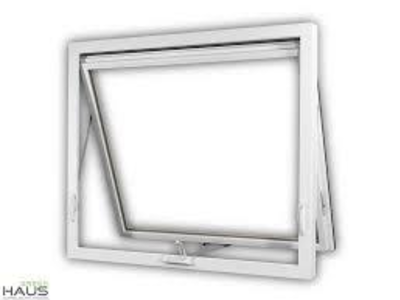 This ingenious and secure window system allows the window to be locked in a tilted ventilation position, can be fully opened inwards for easy cleaning and easy escape access in the event of an emergency. The Tilt & Turn has double compression gaskets to eliminate draughts and drastically reduce external noise. 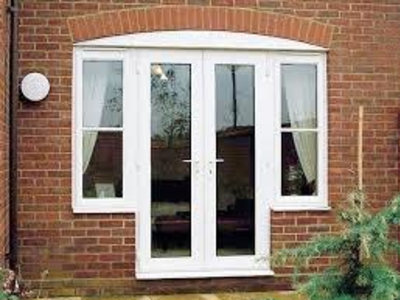 This system can be made in various sizes ranging from small windows to doors. As the size increases more locking points are installed to maintain exceptional sealing performance. They are fitted with dual brush gaskets, multipoint locking mechanisms and heavy duty rollers which roll along a specially designed aluminium track insert, ensuring long and easy use for the operator. The sliding doors are very similar to their matching window system; the profiles are larger and have heavier duty rollers fitted, making their operation just as smooth and effortless. This system can be manufactured with single or multiple opening panels making them very versatile, they are fitted with dual brush gaskets, multipoint locking, and the profile allows a glazing unit up to 24mm thick . The fly screen can be sliding or retractable depending on opening styles. These systems use the same scissor stay hinges allowing the window to stay in the position that it is opened to. All systems use multipoint locking systems and have a lockable ventilation position. The Awning opens outwards and also accepts the large 36mm glazing. It also has double compression gaskets. This great door system provides an easy to use secure everyday door that has a multipoint locking mechanism for when you’re out and the simplicity of a standard type door latch for when you’re at home. The secondary door opens with two simple but secure finger operated shoot bolts. With the secondary door opened it gives more ventilation on those hot summer days, and that larger opening for entertaining or bulky furniture removals. The versatile French doors can be manufactured to either open inwards or out with the primary door on the left or right side. They are fitted with double compression gaskets and 3 way adjustable hinges. This system will accept a retractable type fly screen and door opening restrictors can be installed to limit the opening of each door. This hinged door system can be made to open either in or out and left or right opening. Options can be full or partial glass with panels. They are double glazed and have multipoint locking system. 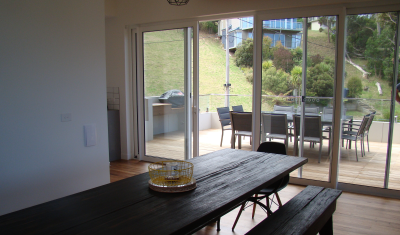 The Bi-fold Window & Door systems are the modern day answer to indoor/outdoor living. This clever design system allows multiple panels to fold away, leaving an un-obscured opening without compromising performance or security. This system is fitted with double compression gaskets, multipoint locking system and can be manufactured in several configurations. The Tilt & Slide system combine the benefits between the tilt & turn and Sliding systems. This allows secure ventilation in the tilt position with improved sealing over the standard sliding system. This system is fitted with double compression gaskets, multipoint locking system and accepts the larger glazing units of up to 36mm. Message sent successfully. We will be in contact shortly. © Copyright Thermosmart Windows 2016. All Rights Reserved.